Home / Events / Events / Casual Wednesday: Movie Night! Categories: Arts One - academic event., Arts One - social event. 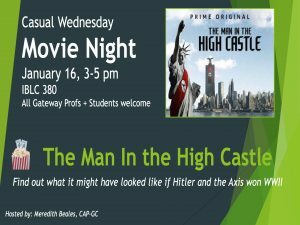 All Gateway Students + Profs are invited to enjoy a movie together! Hosted by UBC-CAP-GC Instructor, Meredith Beales (CAP lecture movie). Special Guest: Meredith Beales will be on hand after the movie for a chat and Q&A.